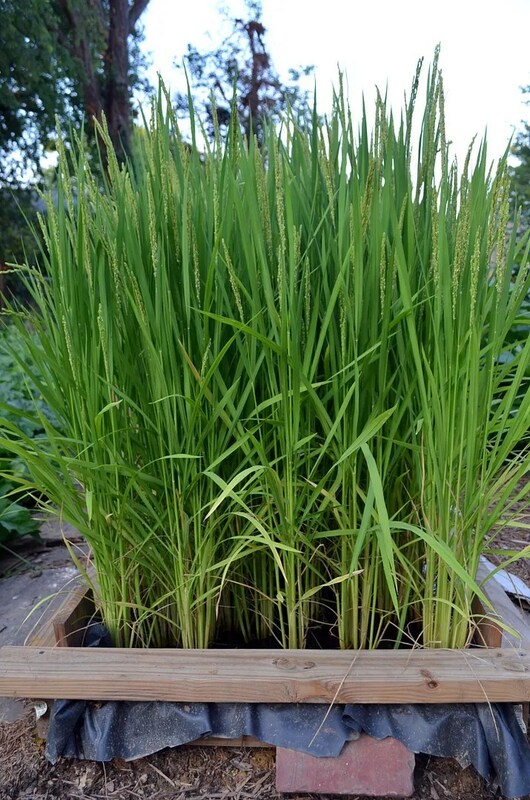 From the end of the “paddy”, you can really see how the plants have developed. Each seed created a mall single stalk when sprouted; once rooted the plants put up several additional stalks. With each plant now comprised of at least 8 or 10 stalks it would appear that I planted multiple seeds in each spot and never bothered to thin them. A closer look shows that each of the stalks will have a single cluster of seeds (“the panicle”) with no branching at all up the stalk. 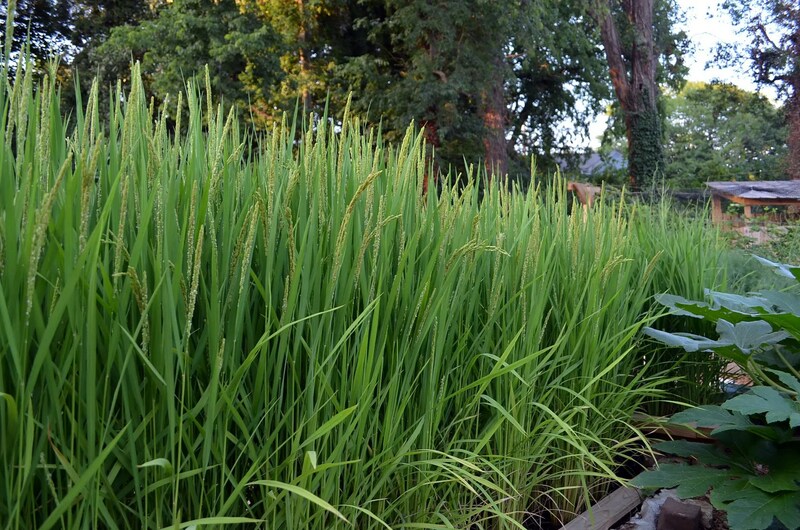 How will I know when the rice is ready to harvest? 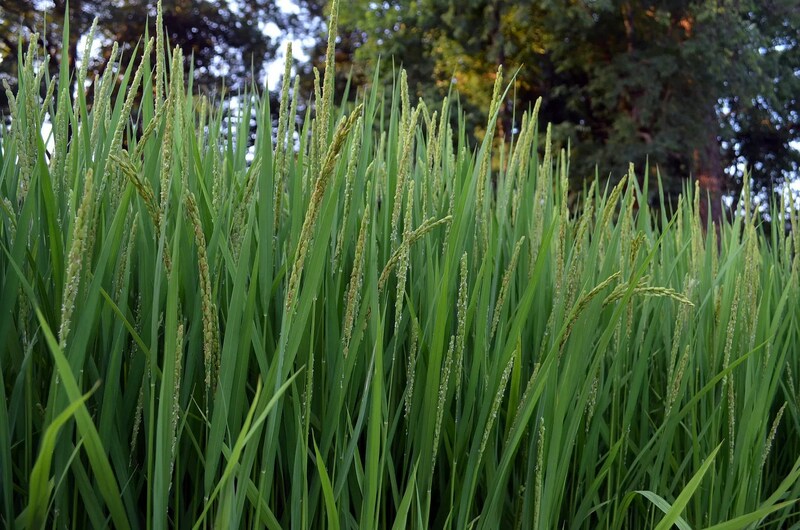 I’ve found several resources on the web, the most comprehensive being the Cereal Knowledgebank co-sponsored by the International Rice Research Institute (IRRI). The main rice page is here. Fortunately this resource covers methods of harvest and processing ranging from using state of the art industrialized equipment all the way down to the barest of manual labor. Several of the photographs include participants who most definitely qualify as this “barest of manual labor” in that they aren’t in closed toe shoes or are barefoot. While my processing techniques will fall into this “BML” category, for the record I do intend on wearing my boots. There are other guidelines for harvest timing listed that are beyond the guessability quotient of this backyard rice farmer so I’ll just wing it based on these two. What a beautiful thing! Nice experiment! Be fab if you can have a meal with your home grown rice. 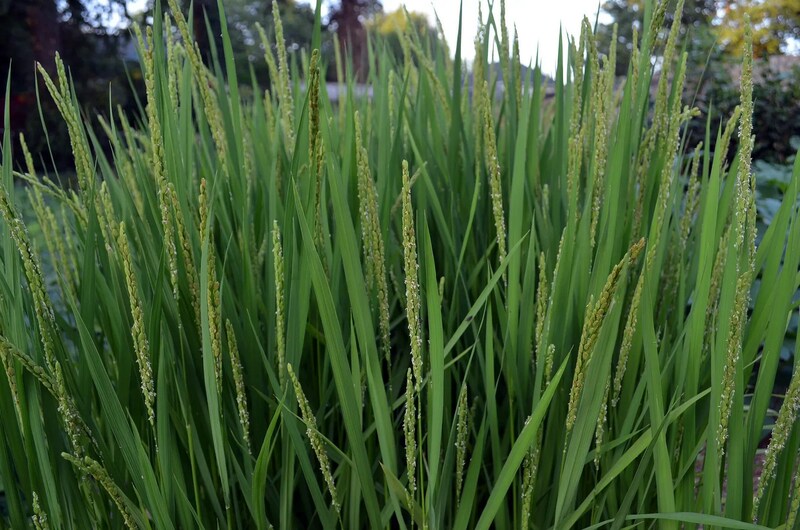 Thank you Genene; I really liked the uniform look of the only rice I had ever seen growing (in South Carolina along the Waccamaw River) and figured it would look nice even if it didn’t produce anything.